Slideshare is one of the more useful startups launched in the past few years, as it means you can view slideshows without having to attend events. It is Youtube for Keynote and Powerpoint. I’ve just viewed a compelling / amusing 26-slide presentation on ‘Twitter party theory’ by Poke creative director Iain Tait, and thought I’d share it with you, along with four others that I’ve enjoyed recently. They include a comprehensive overview by Ogilvy PR, and a great slideshow by Adam Schoenfeld that takes a detailed look at running contests on Twitter. The Roger Smith Hotel may be the most social media savvy hotel in New York — if not the world. There’s a blog. A Facebook fan page. A YouTube Channel. Over 3,000 Twitter followers. A Flickr photostream. And two guys behind all these efforts, both of whom winnowed their way into overseeing online marketing for the property following stints in food and beverage services at the hotel. We caught up with Adam Wallace, the hotel’s new media marketing manager, and his sidekick Brian Simpson, whose official title is still assistant food and beverage director, to find out how they built a family-run, independent hotel into a digital force to be reckoned with. Web publishers have a long, tangled history with ad networks. Many newspapers and magazines rely on them to sell off unsold advertising online, but at the same time, they resent the networks for dragging down the value of their overall inventory. The implication is that advertisers are better off buying online ads through publishers than through those lowly ad networks. It may be in the best interest of publishers (like the Wall Street Journal) to slam networks and encourage advertisers to purchase their ads directly. But it isn’t an either or situation. 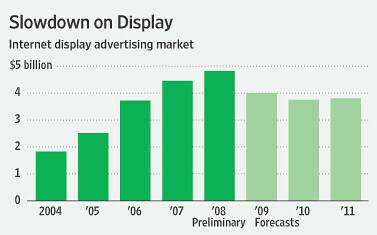 Publishers are giving ad networks inventory they can’t sell on their own. These “remnant” ads are by default cheaper ad content. And smart advertisers are buying both. What if Google gets into the lead gen business? This week Google was sued by Lending Tree, a company whose website enables consumers looking for mortgages and other loans to connect with lenders. LendingTree alleges that Google is planning to launch an online loan exchange of its own and that it will use technology provided by one of LendingTree’s vendor. The problem: LendingTree alleges the vendor is contractually forbidden from working with LendingTree competitors, which LendingTree clearly believes Google is. For its part, Google says that it’s simply “working on a small ad unit test that will run against a limited number of mortgage-related search queries in the U.S.” So while we don’t yet have enough in the way of hard facts to evaluate the merits of LendingTree’s claims, the lawsuit raises an interesting question: what if Google gets into the lead gen business?